Companies that include the legal function in corporate strategy can achieve long-term competitive advantage and even higher stock market valuations, according to research from the Massachusetts Institute of Technology. Case in point: The Walt Disney Company. When its media copyrights neared expiration, Disney’s lawyers transferred that intellectual property into trademarks for various characters, names and images. This not only protected these assets indefinitely, it enabled merchandise licensing – now a multibillion-dollar business. Moreover, many in-house legal departments are too buried in routine requests to play a substantive role in corporate strategy; almost half of in-house counsel say they spend too much time “fighting fires” to achieve any long-term goals, according to a survey by the FindLaw Corporate Counsel Center. In that survey, just 45 percent of respondents said their legal department’s priorities aligned with the CEO’s; 11 percent said there was “no correlation” between the two. How can we remedy this situation? How do we ensure that in-house counsel are engaged in strategy instead of inundated by legal whack-a-mole? Legal operations provides a surprisingly straightforward solution: Track your activity, measure its strategic value, and make smart, data-driven change. The path to strategic alignment starts with two questions: What are we doing, and why are we doing it? 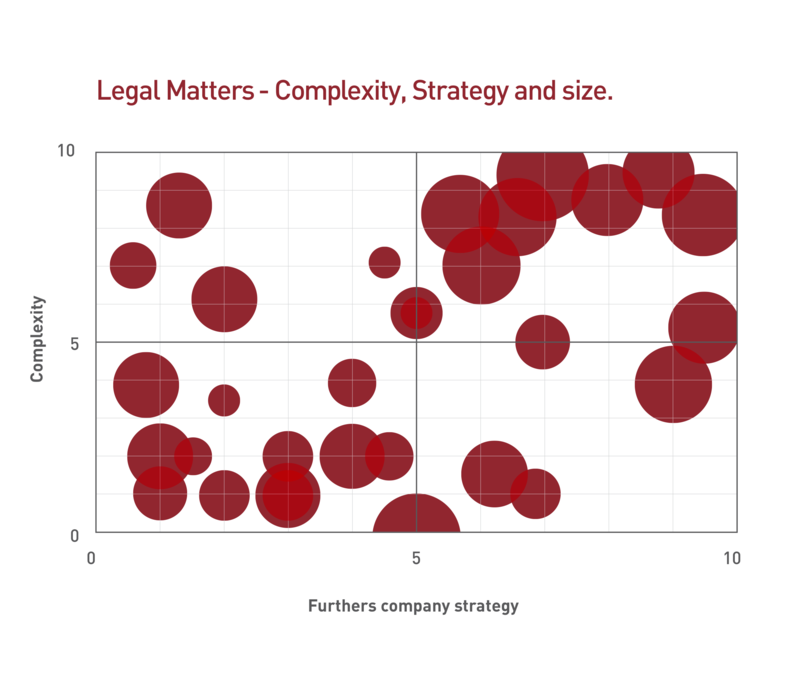 Consider this graph, which shows a department’s legal matters mapped by complexity and strategy: How challenging is this project, and how important is it to the company’s objectives? The size of each sphere is proportional to the dollars at stake, adding a third dimension. Complex + Low Strategic Value: In the upper left quadrant, matters are not likely to move the dial on the strategic plan, but they are legally complex. (At Xakia, we call this the “brain drain” quadrant.) Boutique specialists or unbundling strategies are appropriate here. Simple + Low Strategic Value: Do not spend considerable time or expense in the lower left quadrant. Efficiency opportunities abound! Simple + High Strategic Value: In the lower right quadrant, matters require familiarity with the company’s strategic goals and are best handled internally; junior department members may be the best option. Complex + High Strategic Value: The upper right quadrant hosts your most exciting work; it requires specialized and experienced legal skills to assess the strategic business impact and construct creative legal solutions. Your most experienced (and expensive) resources should be allocated to this work. If you are one of the 55 percent of in-house counsel who don’t feel aligned with corporate strategy, your matters are likely to be heavily concentrated on the left-hand side. Charting and analyzing your data helps you make an informed plan to address this “fire-fighting” work and free up time for more weighty matters. For complex matters, look at “unbundling” batches or find a boutique firm that can provide the specific expertise without Big Law cost. While it is unrealistic to push all of your work into the high-complexity, high-value quadrant, tracking and analyzing your matters will help you achieve a balance – and certainly a closer alignment with your CEO’s objectives. By requiring each team member to measure the strategic value of their work, you engage each individual with the strategic goals of the company. This will inform all legal, risk management and resource allocation decisions you make – aligning you with the CEO. Business leaders can see a data and evidence-based account of the value you bring by protecting the company and advancing its goals. Your C-suite will appreciate productive, evidence-based discussions about budgets, cost allocation and resourcing needs.